TRAP DESCRIPTION: 8" Tall x 24" Wide x 28" Long. 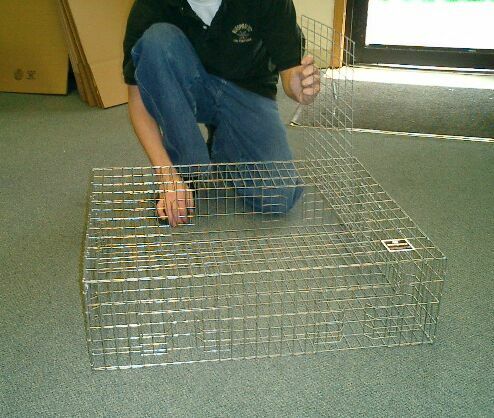 Constructed of 14 gauge wire, this trap features 8 entry doors, 2 to a side, through which pigeons will enter. Once inside, they will not be able to leave due to the one way design of these entry doors. The trap has a large access door on top which is used to remove trapped birds. WHERE TO USE IT: On the ground, on roof tops, on asphalt and basically anywhere you are able to establish a feeding location for pigeons. 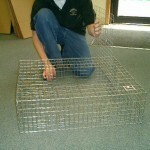 RATE OF APPLICATION: Each trap can hold up to 30 birds. Bait should be placed outside the trap as well as inside, since the bait placed outside the trap will be consumed first, it is important that you have a lot more inside making sure to set out quantities which will not be consumed by trapped birds too quickly. Having both bait and birds inside the trap will help get more birds trapped – particularly when outside placements run out.